The window in memory of Don Ramcharan was dedicated on Sunday, May 24, 2009. Getting to know the Ramcharan’s over the last twelve years has been a gastronomical and spiritual adventure. Jerk chicken and doubles were as much a part of every visit as were deep discussions of theology and faith. Don was a preacher’s kid who never lost his devotion to God and his commitment to know and serve God better. It’s my pleasure to introduce Elaine and her children Greg and Lygia and to welcome all of their friends and family to this special service of dedication. “It’s hard to believe that a year has gone by so quickly since my husband Don was called away from us. We are here, my family and I to honor his request by putting into our church a stained glass window in his memory. Many of you may not know this, but his Dad, the late Henry Ramcharan, was a Presbyterian minister, and preached for many years in a church which Don’s family and mine attended. We were also married in that church, which had a very large stained glass structure. Anyone coming into that church could not help but notice its beauty, because it was significant with Christ our Redeemer as the focus and two of his beloved disciples, Peter on the right, and John on the left. Also along both sides of the church were stained glass windows of the other disciples – the larger part of the window, that is. The strip on the side opened to let the beautiful tropical air blow through. But the presence of the Lord was felt each and every Sunday by our congregation. “Jesus, who is at the head of the window, is also first and foremost in our hearts, homes and being. This window was made to remind us of how important He is in our lives. The theme of music comes from the love Don shared being in the choir for over 20 years and singing the praises along with his devoted loyal sisters and brothers in Christ. Their commitment in making our church come alive with anthems, concerts and cantatas is truly a tribute. So I sincerely hope that when they look across the way to the window, they’ll think of Don as being there with them in spirit. 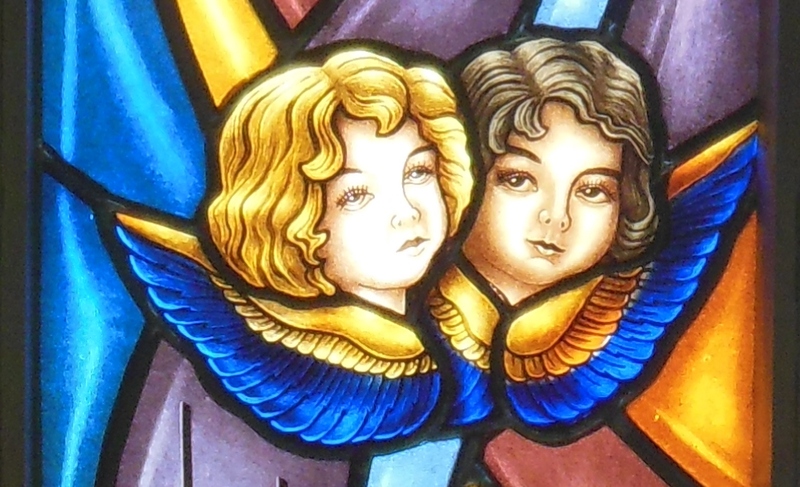 The cherubs are all different. The first one has red hair and is lighter in color than the two lower down. One is almost olive in color with brown hair and the other, tanner with black hair – telling us that Jesus loved us all with no discrimination of color or creed at all. This window is a living memorial to Don. It embodies his life of faith, his deep love of family and his determination to bless the world with his life of kindness and grace. Blessed are you, Lord, God of all creation; You are the source: the wellspring of love. You have made us in your image and gifted us with creativity and love. We thank you now for Don Ramcharan – his imagination, industry and his love for his family and friends. We thank you for his family, who have played such an integral role in the life of this church. We thank you, Holy One, for the love that motivated the gift of this window; for the memories that are treasured and, in part, are represented here. We pray for Elaine, Greg, Lygia and Randy and all the family – that their joy at giving this gift might be shared by all who look in wonder at the majesty of it. We thank you for Wanda, whose imagination and skill have brought to life the images and stories, the scriptures and prayers of those who shared the vision for the window. We ask your blessing on her work. And now, Lord God, we dedicate this window to your glory. That all who look upon it; all who meditate on the pictures; all who marvel at the beauty; will find themselves drawn deeper into your eternal embrace. We pray that your light will shine in us as it shines through this window. That your love for the world will be seen in us, as it is seen in the love evoked in these images. May all who see this window find that the Holy Spirit opens their eyes to the wonder of God’s love shown in Jesus Christ. Lord God, we dedicate this window and ourselves to your glory, for your, Lord, is the greatness, the power, the glory, the splendor, and the majesty; for everything in heaven and on earth is yours. All things come from you, and of your own do we give you. Amen.